Death comes for all of us eventually. He may not be present on all the calls we go on but on some I certainly feel him there. Sometimes it's time for him to do his job but other times it's not...and that's where we come in. On these calls it's like he's there just waiting for us to fail and we're doing our best to keep him away. Sometimes we're successful and sometimes we're not. On certain days I feel like he's a ride along with us in the ambulance, I wonder if he ever takes a smoke break when we're taking a breather. Oh, and in reference to your last sentence in the above paragraph, since the medics I work with call me either "Lady Death" or "Death Angel" because I'm also a Coroner, I listen to the radio and take a smoke break while the medics are transporting code blue because I know I will soon have to pronounce and make notification to the family of the patient they just tried so hard to save. I absolutely LOVE this one. It represents my life entirely. I have been a paramedic for 20 years. I am married to a firefighter AND I am also a Chief Deputy Coroner. So to have all 3 of those things represented in the same picture is awesome! My jobs place me on both sides of death. I have learned over the years that death can be like your worst enemy or it can be like an old lost loving friend that is welcomed. 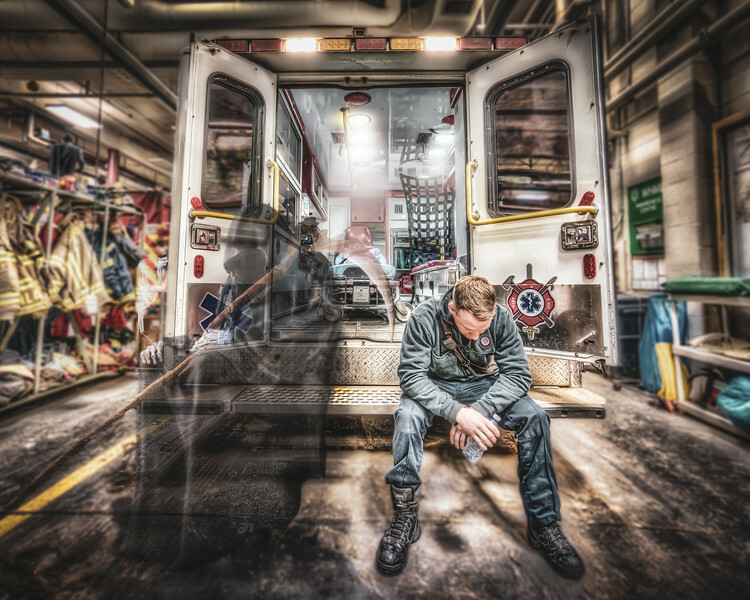 There are worse things than death and us as medics, firefighters and police we have unfortunately and too often seen those things. Your artwork is unbelievable. Only someone in these fields, like yourself, can truly capture the raw emotion that comes through in your drawings. Thank you!!!! Looking forward to seeing more!